HELENA, Mont. (AP) — Protections that have been in place for more than 40 years for grizzly bears in the Yellowstone National Park area will be lifted this summer after U.S. government officials ruled Thursday that the population is no longer threatened. Grizzlies in all continental U.S. states except Alaska have been protected under the Endangered Species Act since 1975, when just 136 bears roamed in and around Yellowstone. 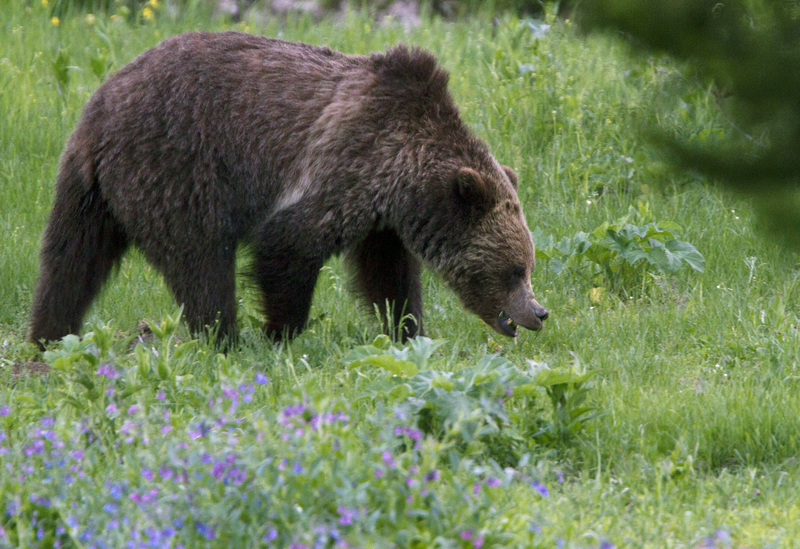 There are now an estimated 700 grizzlies in the area that includes northwestern Wyoming, southwestern Montana and eastern Idaho, leading the U.S. Fish and Wildlife Service to conclude that the population has recovered. “This achievement stands as one of America’s great conservation successes,” Interior Secretary Ryan Zinke said in a statement. Grizzly bears once numbered about 50,000 and ranged over much of North America. Their population plummeted starting in the 1850s because of widespread hunting and trapping, and the bears now occupy only 2 percent of their original territory. The final ruling by the Fish and Wildlife Service to remove Yellowstone grizzlies from the list of endangered and threatened species will give jurisdiction over the bears to Montana, Idaho and Wyoming by late July. That will allow those states to plan limited bear hunts outside the park’s boundaries as long as the overall bear population does not fall below 600 bears. Hunting bears inside Yellowstone would still be banned. The bears roam both inside and outside the park, and their range has been expanding as their numbers have grown. The Obama administration first proposed removing grizzlies as a threatened species by issuing an initial ruling in March 2016. The 15 months that have passed since then have been used to by federal officials to evaluate states’ grizzly management plans and respond to themes of concern generated by 650,000 comments from the public, including wildlife advocates and Native American tribal officials who are staunchly opposed to hunting grizzly bears. Some 125 tribes have signed a treaty opposing trophy hunting grizzly bears, which Native Americans consider a sacred animal. Thursday’s ruling is certain to be challenged in court by conservation groups that argue the Yellowstone bears still face threats to their continued existence from humans, climate change and other factors. Tim Preso, an attorney for environmental law firm Earthjustice, said his organization will look closely at the rule. Matt Hogan, the deputy regional director for the Fish and Wildlife Service’s eight-state Mountain-Prairie Region, said he is confident that the science behind the decision and the management plans the states will follow will withstand any lawsuit. “We feel like this species is more than adequately protected in the absence of (Endangered Species Act) protections,” Hogan said. Endangered Species Act protections set strict rules meant to protect species from being killed or their habitat being harmed, as opposed to state management practices that can include hunting or trapping as a means to keep an animal’s population in check. Wildlife officials in Montana, Idaho and Wyoming have been managing the bear population alongside federal government officials for decades. Those states have submitted management plans that have been approved, and will follow strict regulations to keep a viable population of above 600 bears, Hogan said. Scientists also studied the effects of climate change on grizzly bears and their food sources, such as the nuts of whitebark pine trees, which are in decline. “They found grizzly bears are extremely resilient, extremely flexible and adaptable,” Hogan said. That adaptation has meant switching from nuts to a meat-based diet. That carries the risk of bringing the bears into greater conflict with ranchers protecting livestock and hunters searching for elk and deer, and grizzly deaths caused by human conflicts are on the rise, said Andrea Santarsiere, an attorney for the wildlife advocacy group Center for Biological Diversity. “Added to those threats will be trophy hunting,” she said. The federal agency will continue monitoring the grizzly population over the next five years, and certain factors would prompt a new federal review of the bears’ status, such as a high number of female deaths for three consecutive years. The ruling does not directly affect other populations of grizzlies that are still classified as threatened but which wildlife officials consider recovered, such as the estimated 1,000 bears in the Northern Continental Divide area of Montana and Idaho. Federal resources used to prepare the final rule on Yellowstone’s bear population will be shifted to planning for lifting protections for the bears living in the Northern Continental Divide, Hogan said.